Voter ID is now in effect! Voters must bring a photo ID to the polls in 2016. The Government Accountability Board website is a good place to start for election information. (http://gab.wi.gov/voters). My Vote WI provides all voters with registration, sample ballot, municipal clerk and polling place information. (https://myvote.wi.gov/). To vote in Wisconsin you must first register to vote. You can start the registration process online at My Vote WI: myvote.wi.gov. You can also register in-person at the Town Clerk’s office or at the polling place on Election Day. 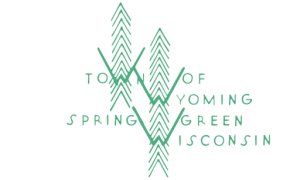 Registered Voters may request an absentee ballot for one election or for all elections in a calendar year by making a request in writing to Town Clerk Mary Lloyd-Jones, 161 W. Jefferson St., PO Box 1013, Spring Green, WI 53588 or TownofWyoming@gmail.com. You must provide a copy of your Photo ID or you will not receive a ballot. Registered Voters who wish to vote in person early by absentee ballot may contact Town Clerk Mary Lloyd-Jones at (608) 588-9000, or TownofWyoming@gmail.com for an appointment or stop in at 161 W. Jefferson. You MUST bring your Photo ID. 1. BY MAIL: Download the Application for Voter Registration (EB131), complete the form and mail it into your municipal clerk's office up to 5:00 PM on the 13th day before the election, along with a copy of your proof of residence. 2.IN PERSON: Register in the municipal clerk's office up to 5:00 PM on the Friday before the election. You must bring your proof that you have lived at your present location for 28 days preceding the election. Contact Clerk Mary Lloyd-Jones at 608-588-9000. 3. AT THE POLLING PLACE ON ELECTION DAY: If you wish to register to vote at your polling place, you must bring proof that you have lived at your present location for 28 days preceding the election. Note that if you have a Wisconsin Driver's License, that number is required on the registration form. If you do not have a WI Driver's License you may use a Wisconsin identification card number. If you have neither of these, the last four digits of your Social Security number are acceptable. One of these numbers plus your birth date are required to process your registration. A current and complete residential address, including a numbered street address, if any, and the name of your municipality.